This page is a chapter in the book How Do I. Here is a tutorial on posting photos on Ausphotography. * Photos must be under 400KB (this being 409,600 bytes) and under 1200 pixels on the longest side (as at January 2016, and subject to change). * During upload if a photo does not meet the above, the upload will reject, giving a reason why. 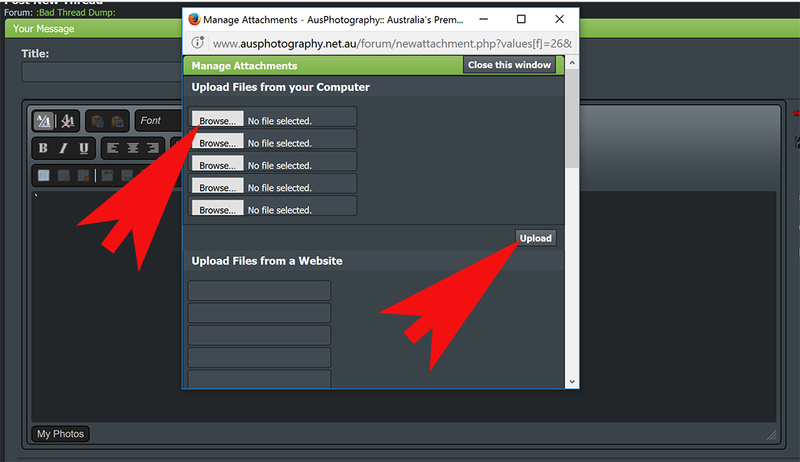 Once you get to the screen to create your thread, use the paperclip icon if you wish to upload your photos direct to the Ausphotography server. When you click on the paperclip icon a pop-up window appears, where you then click browse to locate each photo on your computer. You can upload a maximum of 5 photos to each post. When you have chosen all your photos, click upload. Once upload is complete you can close this window. Return to your thread, complete any text you wish to add, then I suggest you preview. This will give you a look at how your thread and photos will appear. if you are happy, choose submit. Once you have that link copied, then in your post you need to set up some IMG tags to tell the site software that you are linking to an Image file. Image tags look like this [img] what this does with the square brackets is tell the site software that the next bit of code is an image so to display it as an image. You also then need to tell the software when the image link finishes. This is done with the square brackets again but you include a / character as well. So [/img]. Many hosting sites have automated scripts to create the above for you, and you can simply copy the entire code from the hosting site, straight into Ausphotography. You can move the code around, put text above or below it. Highlight it and choose centre (from the icons above the text box, to centre the photo on screen for viewers etc. When you are done, you can preview, or submit your thread. All times are UTC +10. The time now is 2:36am.